Jeanine Payer's jewelry reminds me of precious perfectly-weighted nuggets of beauty -- the sort we dreamed of as kids, filling our pockets with shiny stones that felt yummy in our hands. 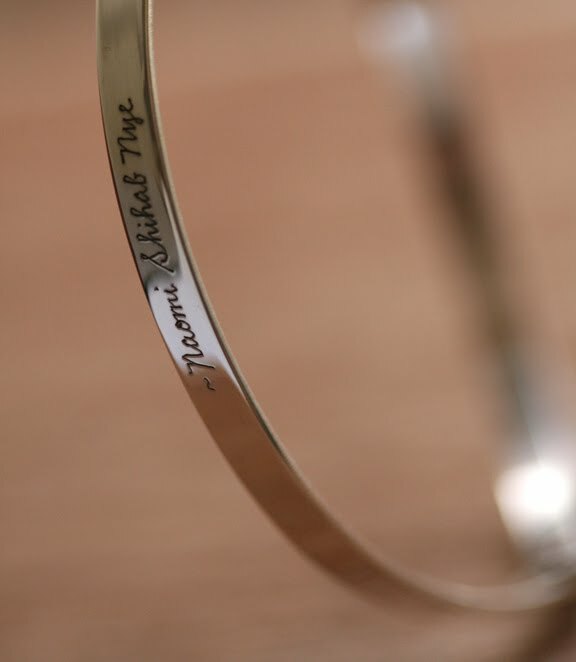 Having lines from my poems inscribed on Jeanine's bracelets, necklaces, and one ring (my traveling companion!) is an amazing blessing. A poem is a nugget. A line of a poem is a tinier incremental nugget. Nuggets finding friends. 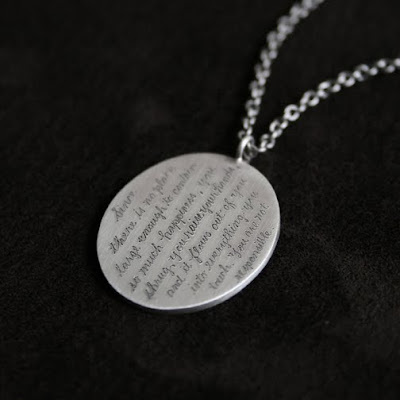 I prefer publishing on Jeanine's astonishing jewelry to publishing in BOOKS. My creative process is very simple. I write often, in a notebook, with a pencil or a pen, and I go back to it. Hospitality to the images and snippets which drift through all our minds, an attention to signs of all kinds, an affection for bits and pieces, scraps and "wisps" or "hints" -- as William Stafford called them -- this is how everything begins.